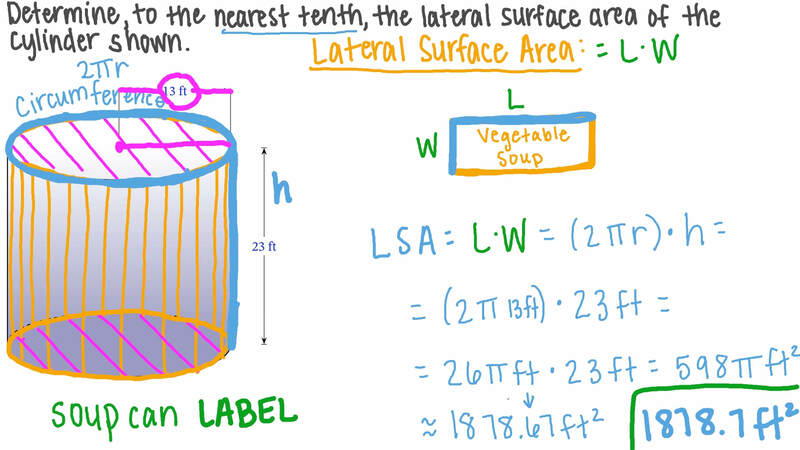 In this lesson, we will learn how to calculate the surface area of a cylinder and solve word problems in a real-world context. Determine, to the nearest tenth, the surface area of a tin can with a radius of 8 centimetres and a height of 16 centimetres. If the height of a cylinder is doubled, will its surface area also double? Determine, to the nearest tenth, the lateral surface area of the cylinder shown. 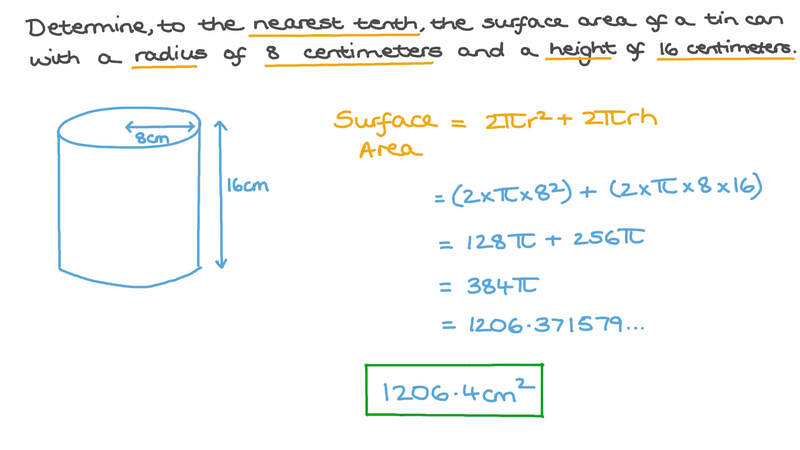 Find, to the nearest tenth, the total surface area of this cylinder. There are two cylinders. The first is of radius 7 and height 4 and the second is of radius 6 and height 7. Which cylinder has the larger surface area? A cylinder has a volume of 900 cm3 and a base with a diameter of 14 cm. Find the height of the cylinder to two decimal places. Find the surface area of a cylinder whose base is a circle of radius 21 cm and whose height is 9 cm. Use 𝜋 = 2 2 7 . Diana and Steven were calculating the surface area of a cylinder of height 28 and radius 9. Diana found the surface area to be , and Steven found it to be . Who is correct? Find the diameter of the base of a cylinder if the surface area is 4 9 6 𝜋 square centimeters and its height is 23 centimeters. The given diagram shows a cylinder of radius 𝑟 and height ℎ . An expression for the total surface area of the cylinder is 2 𝜋 𝑟 ℎ + 2 𝜋 𝑟 2 . What does the term 2 𝜋 𝑟 2 represent? Factor the total surface area expression completely. 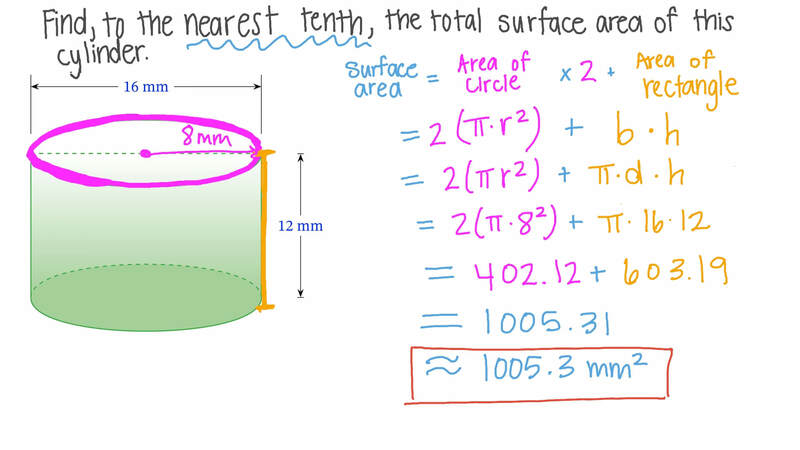 Determine, to the nearest tenth, the surface area of the cylinder shown. Determine, to the nearest tenth, the surface area of a cylindrical barrel of diameter 22 inches and height 2.2 inches. Two similar cylinders have radii of 3 inches and 20 inches. What is the ratio of the surface area of the smaller cylinder to that of the larger one? Bassem wants to wrap a solid cylinder with a sheet of paper. The radius of the cylinder is 10 cm and its length is 40 cm. The dimensions of the sheet of paper are 4 0 × 3 5 c m c m . What proportion of the cylinder will he be able to cover? Give your answer to two decimal places. Calculate the radius of a cylinder with volume 1 7 6 𝜋 cm3 and height 11 cm. A cylinder has a volume of 5 3 5 𝜋 cm3, and a radius of 11.9 cm. Find its height to the nearest centimetre. A cylinder with a radius of 5 inches has a volume of 9 2 𝜋 cubic inches. Work out the height of the cylinder, giving your answer as a decimal. Three tennis balls are packaged one on top of the other in a can. Which measure is greater, the can’s height or circumference? Diana and Steven were calculating the surface area of a cylinder of height 16 and radius 6. Diana found the surface area to be , and Steven found it to be . Who is correct?